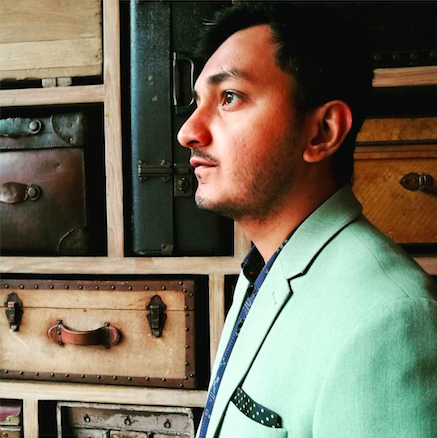 IndiQube has raised Rs 100 crore of equity in a round led by WestBridge Capital. The round also saw participation by Ashish Gupta, co-founder of Helion Ventures, who serves on the advisory board of the company. The funds from this round will be used to strengthen the company’s execution capabilities and the company’s aggressive expansion plans across Bengaluru, Pune, Hyderabad, Chennai, Mumbai, and NCR. May 11, 2018 / Comments Off on Are you a startup which has outgrown into a well-established business? When you are in the startup stage of a business, you will be mostly working from home or a small garage, slowing making your way to coworking spaces and then plunging into dedicated, professionally managed workspaces with more number of employees and better investment. However, you cannot attain this growth overnight. The exact phase when you can stop calling yourself a startup depends on a few qualitative and quantitative factors that enable teams to take independent decisions, thus influencing a startup to outgrow into a well-established business. IndiQube, has leased 24,000 sq ft space in Baner, Pune. The centre will have 300-350 seats and will be operational by June 2018, said Meghna Agarwal, co-founder of the company. It plans to maintain an average rent of Rs 9,000 per seat per month in this centre. Shared workspace or the concept of coworking was not created out of the blue. Companies have long experimented with shared workspace and measured its impact on workers. Several studies have been conducted to measure its influence on productivity, communication, creativity, and community. February 20, 2018 / Comments Off on What does your startup need? At IndiQube, we are committed to the health and well-being of our occupiers and employees. Our workplaces are designed to be well-ventilated, walking-friendly and ergonomic, to ensure improvement of physical and mental well-being of the staff. For example, we’ve seen an explosion of open office layouts, in part because openness, transparency, and collaboration are some of the attributes companies strive for today. Sometimes these designs work well; however, research shows that this collaborative pushmay be too much of a good thing. Increasingly, people are rediscovering the value of quiet and focus and asking for spaces where they can concentrate. At IndiQube, we value entrepreneurs and their thoughts for they form an important foundation in what we do. Through #TheFoundersWay, we get you up, close and personal with the entrepreneurs who are redefining businesses. While Flexible workspaces was initially adopted by freelancers and small teams (not bigger than 2-5 members). The trends are changing, and big teams in big businesses want a piece of it. Corporate employees are swapping suits for jeans and occupying desks at these flexible spaces. In tandem, co-working chains have emerged, offering slick operations. 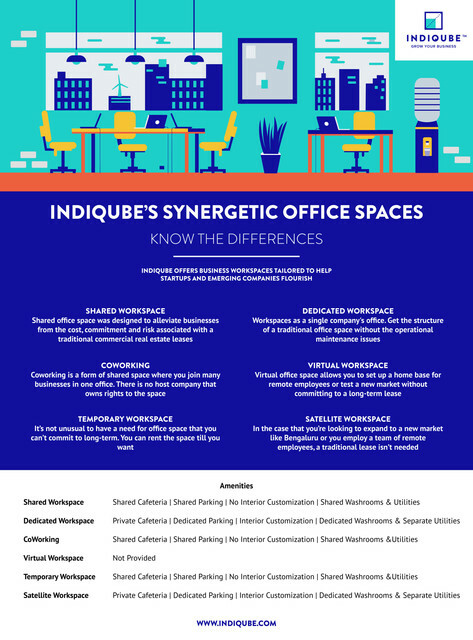 IndiQube is in the business of providing Flexible Office spaces ( Co working and Dedicated ) to start ups , freelancers , Entrepreneurs , SMEs, ODCs and emerging companies. It creates a right business environment for companies to thrive. Growth and Flexibility are the pillars of Indiqube which differentiates us from other players in market. As part of the value proposition, IndiQube designs and delivers co-working / enclosed office spaces, builds and manages common amenities such as cafeteria, gym, reception desk and provides complete office services like maintenance, security, housekeeping, power back-up etc. Our technology driven Ecosystem of growth lets company concentrate on things that matter to their business, by providing well-crafted and professionally managed space infrastructure, Employee Facilities and Partnered spaces. We have developed about 500,000 sft of office space across talent hotbeds in Bangalore and have over 80 clients like Bluestone, FreshMenu, LendingKart, Cloudnine, Redseer and Micromax to name a few.